Hey y’all! I’m Becky, from Becky’s Best Bites. I am so excited to have this opportunity to a contributor to Beauty Through Imperfection!! I love to cook for friends and family and have a knack for making recipes healthier…without sacrificing the most important part, THE TASTE! My blog is full of great recipes that are tasty, healthy, easy and full of fresh ingredients. I am also a health and fitness coach, and am passionate about helping others achieve their goals! I believe that it can be easy to be healthier and nothing has to be off-limits. 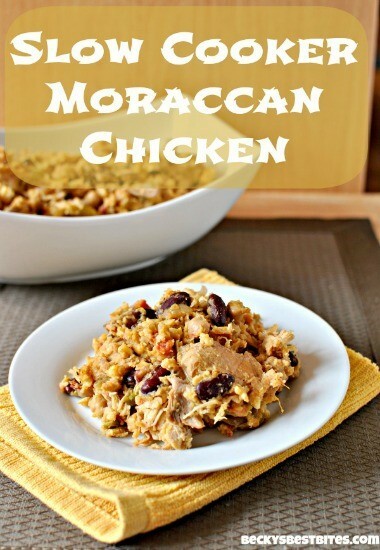 Today I am sharing my Slow Cooker Moroccan Chicken. Take ten minutes in the morning to throw off of these wonderful ingredients in your slow cooker and come home to a house that smells wonderful and dinner that is piping hot and ready!! Boneless skinless chicken thighs stay moist and flavorful. Fresh veggies, two types of beans, lentils and brown rice pump up the fiber content. Fresh herbs and spices like turmeric, saffron, ginger and cinnamon add ton of flavor and have powerful antioxidant properties. Add onions, garlic, celery and carrot to bottom of the bowl. Top with chicken, beans, lentils, rice, tomatoes and all herbs and spices. Pour chicken stock over all ingredients and stir to combine. Stir. Taste and adjust the seasoning with sea salt & pepper. I hope you enjoy this recipe, I look forward to connecting with you. Hey Buddy!, I found this information for you: "Slow Cooker Moroccan Chicken". Here is the website link: https://www.beautythroughimperfection.com/moroccan-chicken/. Thank you.